Life with Birds uncovers the fascinating story of our interdependence with birds. The author weaves an amazing web of inter-relationships, from the Parsi funeral in Mumbai where birds of prey eat the dead; to collecting eider down from nests in Iceland and standing on the once body-strewn battlefield of Agincourt where birds won the day for the English army. From the earliest days of human existence we have exploited birds; for food, for their feathers, to satisfy our blood lust, to entertain us with their beauty, to inspire our art, our advertising, classical music, popular songs and much more. Cage birds are kept for their beauty and song but this book also investigates the repugnant illegal rare bird trade, and the organised crime it has spawned involving around 1.5 million birds a year. Criminals will go to unbelievable lengths when smuggling rare birds for sale and the 1.5m birds in this annual trade threaten the survival of several exotic species. Since time immemorial birds have exploited us too. Birds can use our homes to make theirs and can ruin farmers’ crops in minutes. Some of the most impressive birds have set up home on high-rise buildings, exploiting the city slicker pigeons that live off discarded fast food and much else. 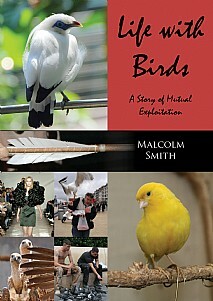 Life with Birds contains intriguing examples of the huge range of interactions between birds and people. How undercover law enforcement in the US is tackling a cruel and bloodthirsty ‘sport’; how birds are being used to smuggle drugs into a prison and across borders; controversial practices such as bird sacrifice in religious ceremonies; and how some Kenyan tribesmen are guided by a bird to find a food they both value. Many myths, magic and religious practices involving birds are exposed such as whether they can predict deadly mining disasters; whether they have killed anyone; and whether the eerie night-time calls in the precipitous mountains of Madeira are the souls of shepherds who have fallen to their deaths. If you have ever wondered what a nest made solely of bird saliva, considered a delicacy in some countries, tastes like or whether you knew Chairman Mao’s ‘kill a sparrow’ campaign in the 1950s resulted in many millions of Chinese dying of starvation, Life with Birds will provide enlightenment as well as a hugely enjoyable read. This will be of immense appeal to all birding enthusiasts worldwide and everyone with an interest in nature and conservation.